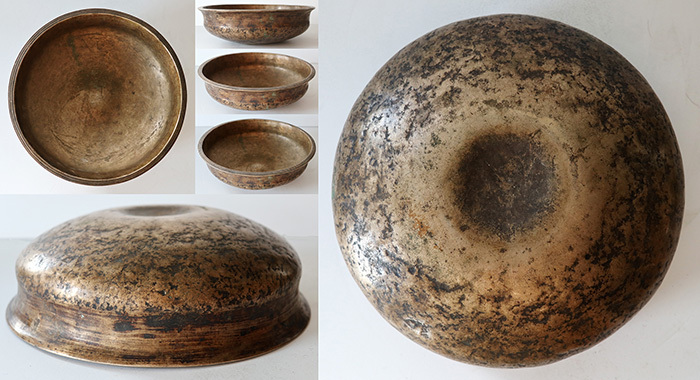 Incredible 18th Century Semi-Lingam Bowl – Perfect Pitch F3 - Talking & Fountain! This rare and versatile antique Singing Bowl, believed to date from the 18th century, has an interesting shallow form, a unique voice and talking and fountain abilities that I wasn't expecting. It features a wide flanged lip with multiple grooves, and a large raised mound or semi-lingam at its centre that is matched by a deep depression underneath. It is in excellent structural condition for its age. The fundamental note is a beautiful and unique sounding perfect pitch third octave F (175Hz). Whilst playing it around the rim I sensed it was 'trying to talk', so I played it again with some water inside and to my amazement it made characteristic vocalizations (a little like squeelings) AND fountains! But buy it for its unique singing voice! This highly collectable ancient singing bowl has bags of character and the most amazing aged patina that reflects its great antiquity. A Tibetan silk brocade cushion, a padded striker, and a double-ended teak and suede ringer are all included in the price.